Hello, fershlugginer comics fans! In this episode, pratfall experts Chris (@AceComics) and Reggie (@reggiereggie) take a look at the life of Harvey Kurtzman and the magazine that changed everything when they read MAD #4 from 1953! After a history of the publisher that begat the rag, they describe all four stories in the issue, providing some brief artist biographies, and concentrating their vocal abuse on "Supderduperman" and "The Shadow!" 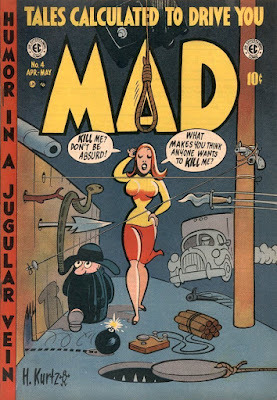 After a break, the Assistants to the Assistant Copy Boy continue discussing Kurtzman and MAD magazine, including the iconic logo and a certain gap-toothed fellow that hasn't a care in the world. This episode is sure to drive any parents buggy, you don't want to miss it!